Prezi Presentation Template for a creative 3D medical or health related presentation. 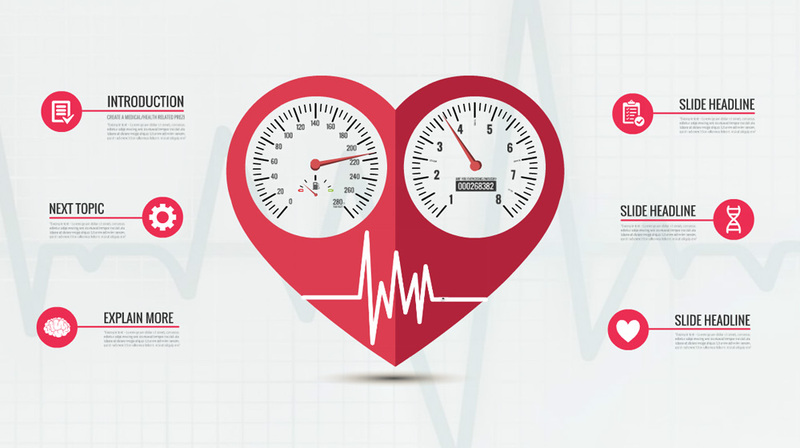 Classic red heart symbol with speedometers on both sides and a cardiogram heart monitor background. Present about the cardiogram results, the condition of health and benefits of exercising regularly. Talk about common heart problems and diseases, how to cure and prevent them. Good template for doctors, medical workers, health educators, personal trainers, fitness teachers. Talk about nutrition, staying healthy, age related problems, and monitoring your heart. This entry was posted in Best Prezi presentation templates and tagged 3d heart presentation, cardio, cardio presentation, cardiogram, creative health presentation, creative heart shape, drug store, exercise, fitness, health, health presentation, heart, heart attack, heart disease, heart monitor, heart monitor background 3d, jogging, medical 3d presentation, medical presentation, medical presentation template, medical template, medicine, pharmacy, prezi template, prezi templates, pulse, red heart, running, speedometer, training.